What was to become one of the most famous photographs in jazz history was shot in the middle of a New York City street by William P. Gottlieb on a rainy night in May 1948. Swing Street it was called, 52nd Street, a legendary site in jazz history because all the jazz greats of the 1930s and '40s played there. Only Art Kane’s 1958 photograph, A Great Day in Harlem, a rivals Gottlieb’s 52nd Street shot as the best-known and most iconic, American jazz scene photograph. The watery reflections of the neon-lit signs of the now storied clubs like The Famous Door, Leon and Eddies, and the 3 Deuces and the musicians’ names on the signs — Art Tatum, Erroll Garner, J. C. Heard, Oscar Pettiford — are part of this photograph’s charm. And because no human figures are shown in it, the viewer’s mind’s eye is released to imagine the dramatic events taking place inside. 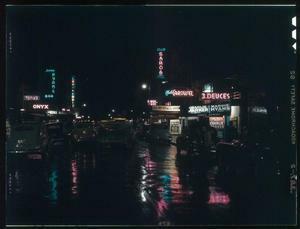 Gottlieb also shot the spot on a dry night; the date provided for this photo is approximate: July 1948, but Art Tatum and Oscar Pettiford were still headliners on the street. Gottlieb could have returned innumerable times to shoot and show different musicians headlining the signs and marquees, but he didn’t. 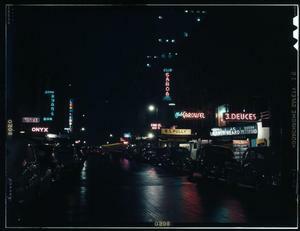 Gottlieb’s two other two nighttime photos of the street seem to have been taken with the intent to document the street at a moment in the 1940s when bebop — a style of blazingly quick and inventive chord changes — was taking over. Two views of one photograph documenting the bebop era show that Charlie Parker and his band members Max Roach, Miles Davis, Duke Jordan and Tommy Potter were playing at the 3 Deuces. 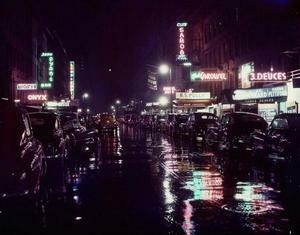 The photograph was taken on a rainy night and indicates that Gottlieb again wanted to create an artistically striking image of the street. 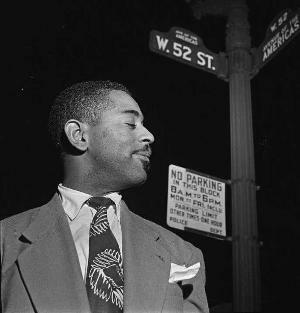 For the other shot specifically highlighting behop, Gottlieb posed Dizzy Gillespie at the intersection of 52nd Street and the Avenue of the Americas. Unlike, the Gottlieb’s other nighttime shots of 52nd Street, the bebop-related photographs are not well known but they are none-the-less remarkable in their symbolic documentation of the ascendancy of the new bop music. Some of the visual magic of 52nd Street faded in the light of day as shown in Gottlieb's long view of the street shot from an intersection. 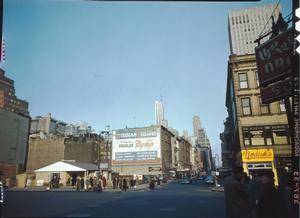 By the end of the 1940s, the street was heading into decline. In December 1949, Birdland opened around the corner on Broadway at 52nd, jazz clubs began to move down to Greenwich Village, rhythm and blues music was rolling in and would spawn the rock and roll that would dominate the music business of the next decade. 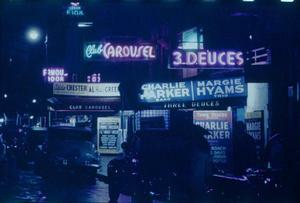 In the 1950s, legendary 52nd Street jazz clubs became seedy strip joints. But in the literature of jazz, like in William P. Gottlieb’s photographs, Swing Street remains vividly enduring. One memorable passage is from Lady Sings The Blues, Billie Holiday’s biography written with William Dufty. Holiday describes the racially-segregated 52nd Street of the early 1940s before the club owners realized that they could not afford their prejudices. The relatively light-skinned Lady Day and the genteel Teddy Wilson were the only African American performers allowed to work on the street but they could only perform as an intermission act. They were not allow to fraternize with customers or even be in the club unless they were performing. So Holiday and Wilson spent their time waiting to perform in the back alley, or sitting outside in front on the street, or in his old beat up car. William P. Gottlieb (1917-2006) was a jazz columnist as well as a photographer. He wanted his photographs to be in the public domain and so his “Photographs From the Golden Age of Jazz” — more than 1,600 photos of the jazz scene from 1938 to 1948, primarily in New York City and Washington, D.C. — are now a part of the Library of Congress collection.